It's that time of year again when we sit down to reflect on the past year & accomplishments and start making plans & resolutions for the new year. Do you have improving your health & fitness on your list of goals for 2014? In July 2012 I made one of the most important decisions of my life...I took control of my health & wellness, I joined a Beachbody challenge group with my friend & coach, Melanie. My initial goal was to fit into my non-maternity pants when I returned back to my teaching job after the birth of my fourth child. By incorporating regular exercise, clean eating, & drinking Shakeology daily I achieved the goal of wearing my old pants, but gained so much more....increased self-confidence, increased energy (I can keep up with the kids now! ), and a healthy lifestyle for my entire family! In 90 days I dropped 40 lbs. & 20 inches and learned how to set a healthy example for my family. Are you ready to take the leap and gain a new lease on life? 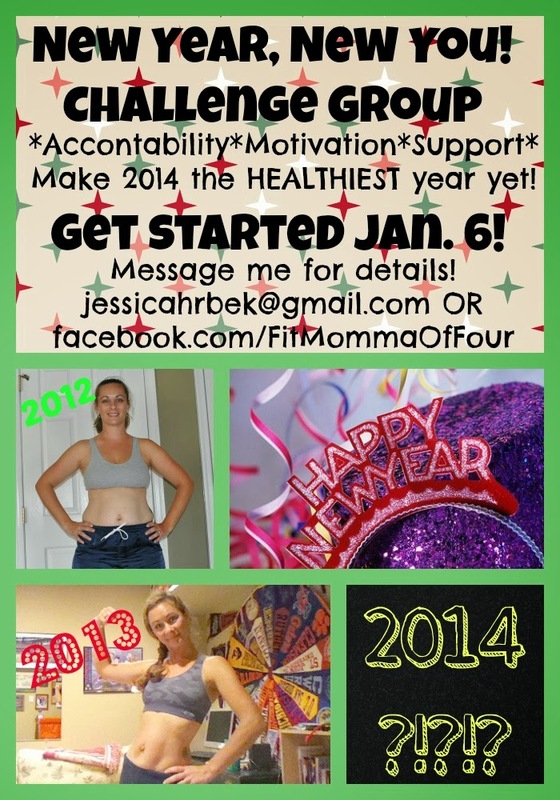 In the New Year, New You Fitness & Clean Eating challenge group you will receive personal support from me, your coach. You will get daily motivation, accountability, health & fitness tips, and access to a community of like-minded people whom are all striving to get fit & healthy for the new year. You will learn about clean eating & be provided with sample meal plans, clean eating recipes, tips for navigating the grocery store, how to eat clean on a budget, guidance on how to make healthier restaurant choices, & more!